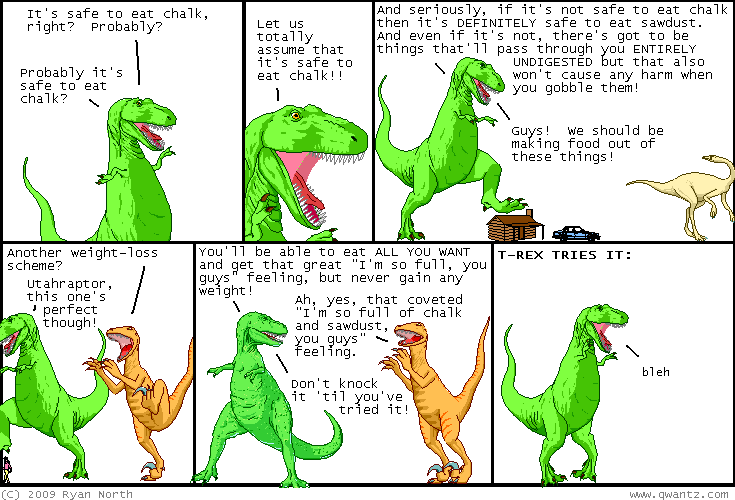 Dinosaur Comics - July 22nd, 2009 - awesome fun times! Guys! HAPPY PI APPROXIMATION DAY! July 22nd, 2009: Farley Katz of the New Yorker and I did a comic battle, in which we both did three comics running with three New Yorker tropes to see who did the best comics, and then afterwards Farley interviewed me. It was fun times! So! READING COMPREHENSION. I got an email from Farley saying "I challenge you", white glove slapping my face and all, and my eyes turned red and steam shot out my ears and I just ran with it. And somewhere along the way I missed the "involving dinosaurs" part that was critical to those whole theme. So the result is Farley did three comics involving dinosaurs and I did three comics that COULD HAVE INVOLVED DINOSAURS SO EASILY, but didn't. Instead, they have people that I struggled to draw. Who is embarrassed? ME. I am the one embarrassed in the New Yorker's Cartoon Lounge. Anyway I think Farley's comics are awesome and the interview was fun and includes a compliment for everyone reading these words right now, so you should check it out! One year ago today: the first three panels are all that remain of my epic Herostratus / Quantum Leap fan fiction, where Hero kept leaping into new lives, and no matter what life or time period he was in, he'd try to sabotage the wonders of the world. oh well!